Celebrity Chef Ming Tsai Offers Free Cooking Demos! Celebrity Chef, Ming Tsai, will be in Miami this Saturday for free cooking demonstrations, book signing and food for you to sample! All thanks to Macy's Culinary Council. Famous for his "East Meets West cuisine", the award-winning chef will prepare: New Style Salmon Sashimi, Asian Ratatouille with Couscous and a Tamari Marinated Tofu Cucumber Salad. Ming will share some of his cooking secrets and also sign his cookbook for you. Best of all, there's food samples for all to try. You may have seen Ming on TV. He currently hosts and is executive producer of the public television cooking show Simply Ming. He’s also the author of three cookbooks and he hosts a weekly podcast offering tips and tutorials on everything from filleting fish to decanting wine. Ming has also received quite a few culinary awards. If you can't make the event, you'll definitely want to visit his website for THE recipes: Tasty, Healthy, and Easy! The featured recipe for the month on his website, is Shrimp & Parsley Wontons with Soy Vinegar Sauce--I'm salivating! For some basic instructions on like how to make perfect rice, Chinese style, or use soy sauce for stir frying instead of table salt, check out the videos below! RSVP: Customer RSVP’s are recommended, but not required. To reserve your seat at the event, please call (305) 662-3533. 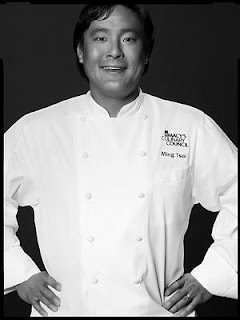 Ming Tsai started cooking at his family’s Chinese restaurant as a teenager in Dayton, Ohio. He then pursued a mechanical engineering degree from Yale University, which proved to be a brief detour in a career that would lead him to Paris, where he Studied at Le Cordon Bleu. Soon afterwards, he began working at Fauchon and Natacha where he encountered east-west cuisine for the first time. Back in the United States, Ming earned his master’s degree in Hotel and Hospitality Administration and Marketing which led him to the Mandarin Oriental Hotel in San Francisco. Fast forward to 1998, Ming returned to the Boston area and opened his three-star restaurant Blue Ginger. Shortly after opening, the restaurant was nominated as “Best New Restaurant of the Year 1998” by the James Beard Foundation, as well as Esquire Magazine honored Ming as the “Chef of the Year 1998.” Numerous accolades followed, including the James Beard award for the 2002 Best Chef Northeast and Second Most Popular Boston Restaurant by the Zagat Restaurant Guide for seven consecutive years.